DACC adult fire program continuing to grow. Trainees in the DACC adult fire course kneel after gearing up as quickly and efficiently as possible. Trainees did extra physical training for every second it took to get ready after the mandatory one minute and 30 seconds gear-up time had elapsed. 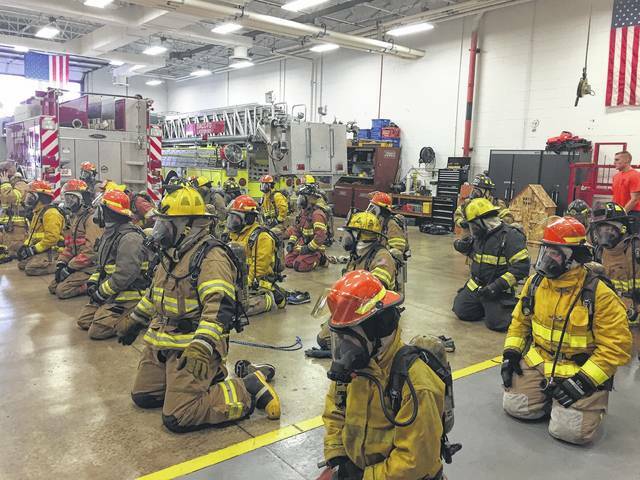 This fall’s section of the Delaware Area Career Center Adult Firefighting program features the highest enrollment in recent years, officials reported last week. The program’s numbers have fluctuated in the past few years, but hit a high this year after 27 students enrolled in the fall section of the course, reported Alicia Mowry, public relations supervisor at the DACC. Mowry said the course had only 13 students in the spring of 2017 and had only 14 in the fall of 2016. The previous high for the program’s enrollment was 19 students in spring 2011. DACC Fire Coordinator Kevin Murphy attributes part of the growth to the program’s reputation for quality. The ongoing course began in August and trainees are already expected to be able to fully gear up in one minute and 30 seconds and the entire class will do extra physical training for every second after that time expires. When one student takes too long, an instructor points out that they have lost critical seconds and said it could result in injury and risk the lives of other firefighters. Trainee Kenzie Crawford, 23, of Marengo, said the training is challenging and reminded her of her basic training from the National Guard. Crawford said she currently volunteers at the Big Walnut Joint Fire District and had the program recommended to her by Fire Chief Lauri Lovell. Nick Leidheiser, 20, of Lewis Center, said the training isn’t just physically taxing, it’s academically rigorous as well. Trainees in the program have a 1,600 page book to study and have to take a number of tests and exams. Murphy said the students will take six module exams and one final exam throughout the course. He said the modules include topics like fire behavior, building construction, and personal equipment. Leidheiser said that one of the best things about the program is the diversity of instructors. The program is already accepting applications for the spring 2018 section. Applications can be found on the DACC’s website.